Skinput is a new input device developed at Carnegie Mellon University in cooperation with Microsoft's research lab in Redmond, Washington. If you think that being able to "hold the Internet in your hand" with the iPhone is cool, you'll like controlling your Internet experience with your skin better. The Skinput system uses two technologies to turn your biggest organ into a workable input device. Tiny pico projectors display choices onto your forearm, and an acoustic detector in an armband detects the ultralow frequency sounds produced by tapping the skin with your finger. Take a look at this nicely produced explanatory Skinput video. 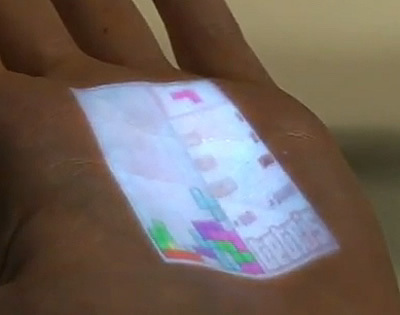 Here, the user plays tetris on the palm of his hand.